I am waiting for the shuttle to take me to Salt Lake City airport. The sky is clear, despite the fact that it snowed all night... The mountains must be full of fresh powder, but it's time for others to enjoy it. I had my share of beauty, Jessica did too (it's our honeymoon!!!). Someday we will be back, that I can say. This is the first log of 2011, and it is about kites. Today I put up the Liquid Force 12 m in 15 mph WSW, at Montrose. 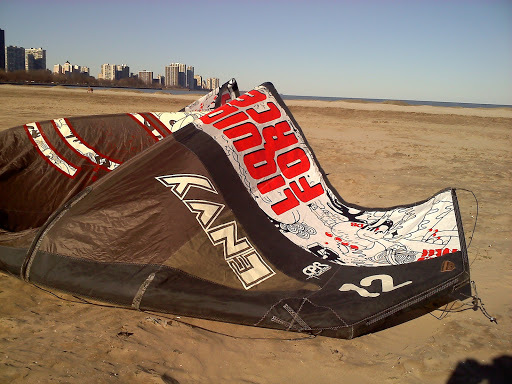 The safety features, the most important part of the kite (for me) work fine, but even at 15 mph it generates too much power for snowkiting, which is amazing because 15 mph is not a lot, but it means that most likely I will need another kite for this purpose. Let the gear accumulation begin!